Sleep in luxurious refinement on this stunning bed. Its benchmark design combines clean lines and button tufts to add sophistication, while the high grade construction allows you to rest easy knowing you're surrounded by quality craftsmanship. Full slat system requires no box spring for mattress, Footboard and side rails included. Available in chocolate . This double bed embodies style and substance in every way. Amplify your bedroom dicor with one of three modern colour choices, and spoil yourself for once. You deserve a great night's sleep. Make it a night on this stunning bed. Available in espresso, as a double-sized bed. Footboard comes with full supported rails. 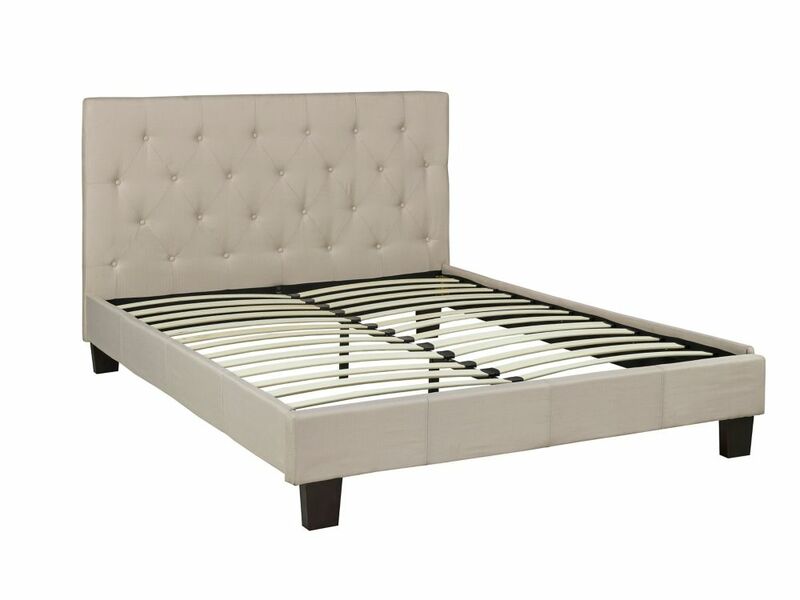 Hampton Queen Platform Bed, Beige Sleep in luxurious refinement on this stunning bed. Its benchmark design combines clean lines and button tufts to add sophistication, while the high grade construction allows you to rest easy knowing you're surrounded by quality craftsmanship. Full slat system requires no box spring for mattress, Footboard and side rails included. Available in chocolate . Hampton Queen Platform Bed, Beige is rated 4.5 out of 5 by 2. Rated 4 out of 5 by John from Pleasant. Looks good, reasonable quality, very easy to set up, and looks like it can handle a move or two.